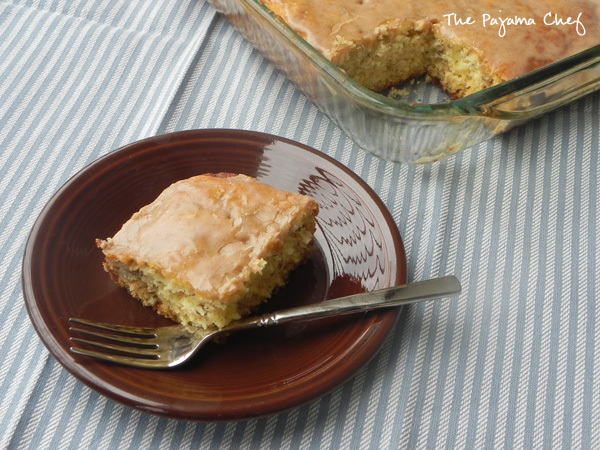 There’s nothing better than a slice of warm banana snack cake with a crunchy cinnamon glaze on top. Enjoy with a hot drink or some cold milk. One of the best cakes I’ve ever had! I’ve made a few other banana cakes in my lifetime–this chocolate chip banana cake with chocolate cream cheese frosting is out of this world–but this simple one is my favorite. My mom’s friend passed along the recipe and it is just so good. It’s one of the first recipes I remember baking on my own. Usually we made it with a very simple powdered sugar glaze, but last time I made it I added some cinnamon and OH MY GOODNESS. Cinnamon glaze > plain glaze anyday. I need to try this on doughnuts. I was seriously eating it with a spoon, so if the glaze looks a little thin in spots… ha ha. Cream together butter, sugar, and eggs. 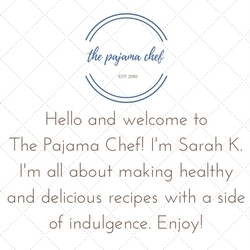 Fold in flour, baking soda, baking powder, buttermilk, bananas, vanilla, cinnamon, and nutmeg. Stir until just combined. Spread in a greased 9×13 inch pan. Bake for 20 minutes, or until toothpick inserted in the center comes out clean. Allow bars to cool for 10 minutes. Meanwhile, make the glaze by whisking together butter, powdered sugar, and cinnamon. Add milk 1 tablespoon at a time, if necessary, to thin glaze. Pour glaze over warm bars and allow to cool completely before slicing. A lovely cake – thank you. We love to make banana cake when our bananas turn brown! 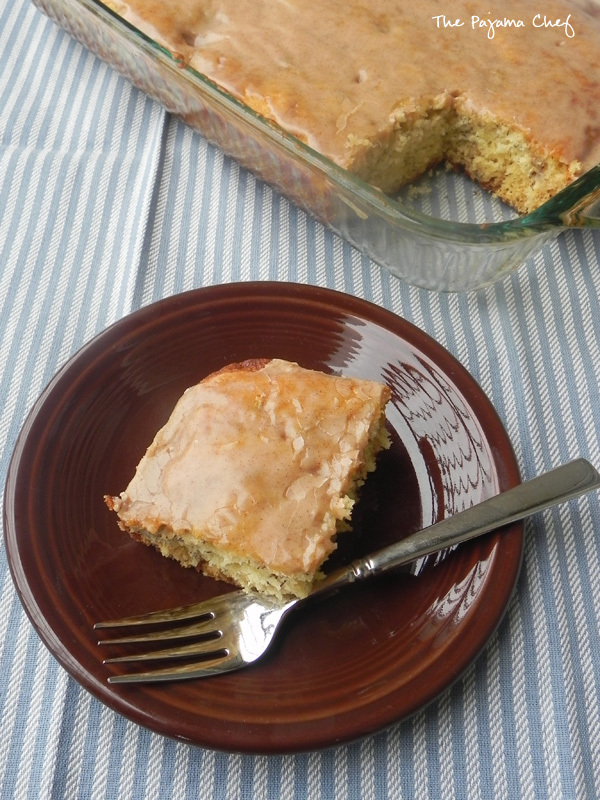 Great idea to top it with a cinnamon glaze! One of those quickie snack cakes that are soooo good. Frankly I have been used a cinnamon glaze. What a keen idea. I like it. I’m the same way about the ripeness level of my bananas and prefer them the same way for the same things you do. This cake sounds soooo crazy good! 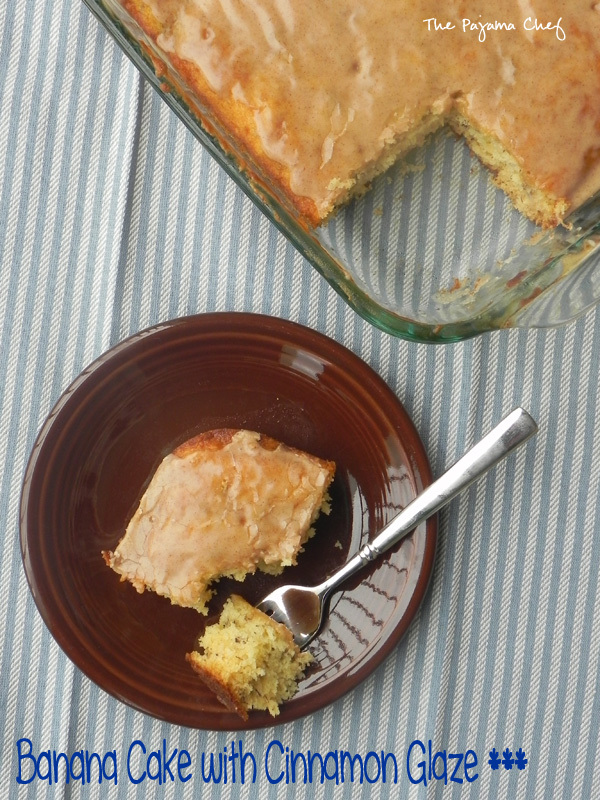 I still want to try your apple cinnamon cake too – they both are a must happen soon in my kitchen!